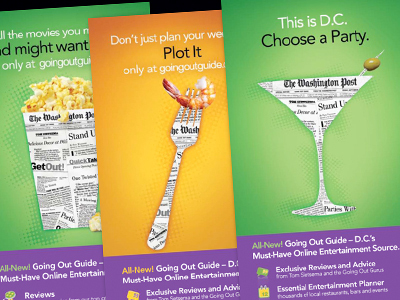 For the launch of the Washington Post’s new dining and entertainment guide, “Going Out Guide” we had a problem: how do you tell people that a 130-year-old newspaper is their best source for what’s hip in DC? The answer: we used the newspaper itself as the visual punchline. And the launch was a success.